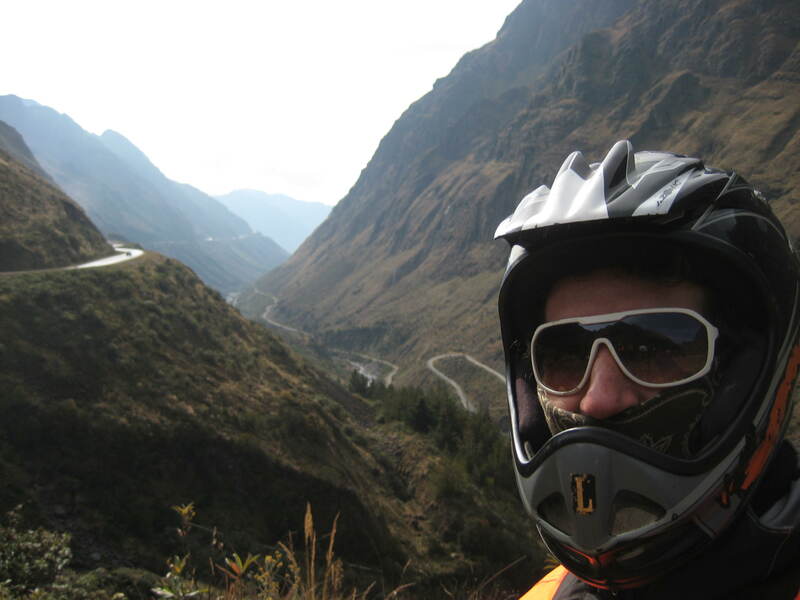 Today we rode the infamous Death Road near La Paz, Bolivia. 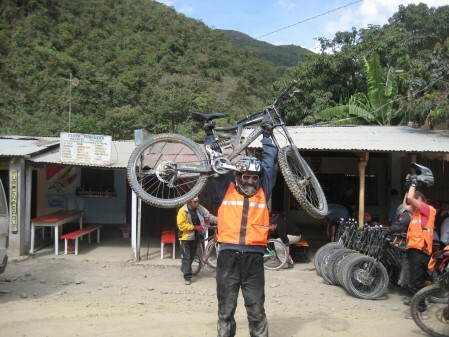 We rode down it on high quality downhill mountain bikes as part of an organized tour by the company called Downhill Madness. They’re based just next door to our hostel, so of course it was easy to arrange. 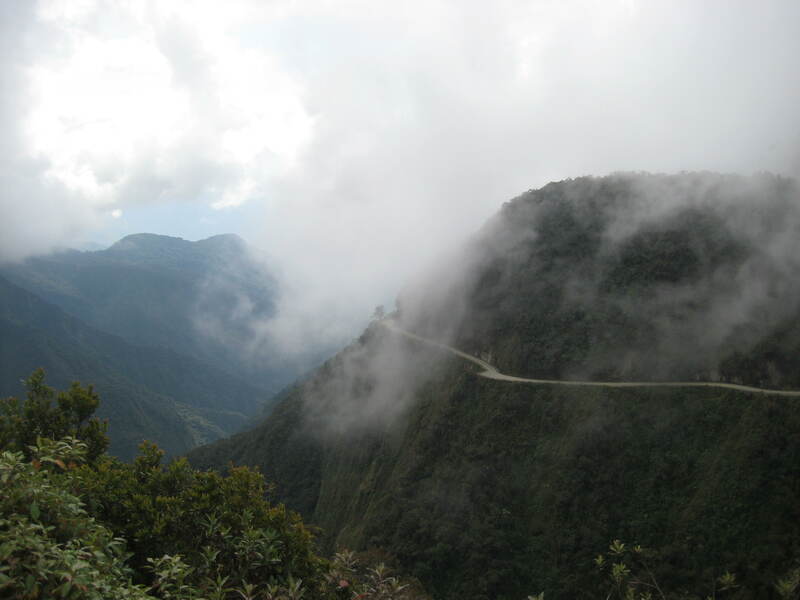 The Death Road is famous (infamous) for being perhaps the longest and steepest downhill stretch of road in the world. 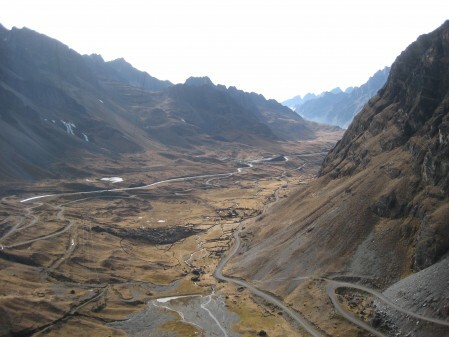 Until not too long ago, it was actually an important road used by cars, making it all the more deadly for adventurous downhill mountain bikers. Now there is a more modern road, leaving this dirt one primarily to the bikers. People come from all over the world to ride this road. Over about 64 km of distance, you descend 3345 meters!! That’s about 2 miles folks! And you hardly ever have to pedal, but you damn well better keep your hands on the brakes. It’s not just called the Death Road for fun. At the edge of the very narrow road (maybe 15 feet, less in some places) there’s a steep cliff dropoff to far below. And many a rider has actually slipped off that edge to their doom. But the real danger in the past was oncoming vehicle traffic. With enough caution and some words of warning from the helpful guides, we did fine. It gets a bit sketchy at times when your back tire is slipping toward the edge of the cliff on the dusty and rocky dirt road as you come out of a turn and you get a gorgeous view of rainforest covered valley below. 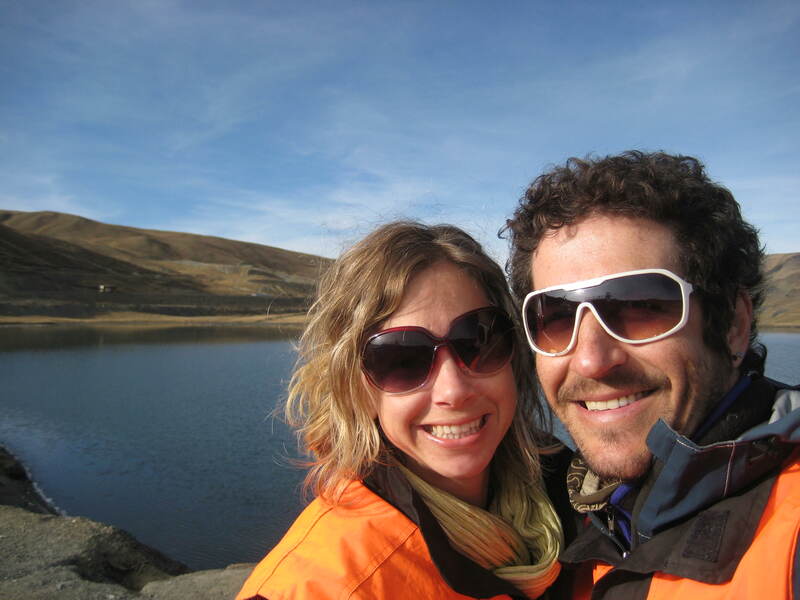 One of the coolest parts of the adventure is the climates you move through in just a few hours. You start the day at high alpine climate, literally seeing snow on the peaks and losing feeling in your fingers from the windchill through the gloves. Then it’s high altitude rainforest in the 3000 m altitude range. Green everywhere, little waterfalls, lots of plants. Then it starts to get warm and even more dusty. 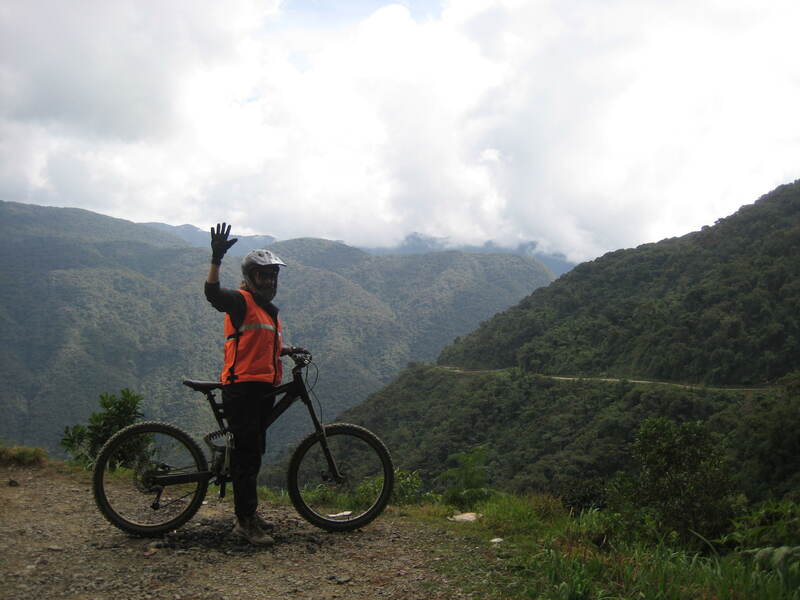 At the end of the descent, you’re at about 1000 m and it is proper rainforest, and warm even though it’s “winter” here now. We were literally sitting by a pool and tanning ourselves after the ride, while we started at the top wearing almost all the clothes we’ve got! Monica with bike and road - bring it on! This entry was posted on Saturday, July 4th, 2009 at 8:57 pmand is filed under Excursions. You can follow any responses to this entry through the RSS 2.0 feed. You can leave a response, or trackback from your own site. You’re bike ride sounds and looks incredible. I’m proud of you guys accomplishing that. Melissa on Brazil ….. continued.